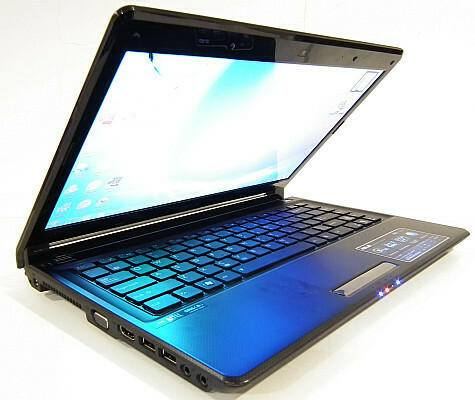 The Asus U45J is a great notebook in terms of design and features. It takes the same technology we first saw in their N15J notebook and this time comes is a much smaller and easy to carry package. The notebook is nice and slim and lightweight with a good battery life. However, when you need the power, it doesn't fall short. The Core i5 coupled with the Nvidia 310M gives you a pretty good multimedia performance, be it older games or watching HD movies. There's also plenty of storage for all your data and the chiclet keyboard is very comfortable to type on for extended periods. The notebook has one flaw though. The build quality just isn't up to the mark and this is not something we expect from Asus. Since they've primarily used plastic to keep the weight down and keep it slim, the display does not have adequate protection. The fact that the screen can distort (permanently if your unlucky) very easily with just a light tap at the back means you'll have to be extra careful with this notebook. If Asus was planning on charging a slight premium for this, the least they could do is use some aluminium or other metal for the lid at the cost of making it a bit heavier. We've informed Asus about this issue and we're hoping they will rectify this before it's launched in India or in their later revisions. Overall, the Asus U45J offers a good balance of battery life and performance, thanks to Optimus in a compact and lightweight package. The only thing that puts me off is the plasticky feel of the notebook and poor protection for the screen. This makes the price of the notebook seem a bit on the higher side.